The Noblemen's Renaissance Breeches are the perfect choice for anyone who wants or needs comfortable yet decorative breeches for a poised, regal look, but does not want to wear something that is too tight or fitted to the leg. These stylish breeches are handmade from fine satin, making incredibly soft and silky to the touch. These breeches also happen to be extraordinarily comfortable as well. The waist of these breeches features a buckle-fastener in the back, which allows for the waist to be fitted properly, giving these breeches some adjustability. The legs are loose-fitted and approximately knee-length. The legs also feature a fitted hem that sits just above the calf. These breeches are available in a variety of attractive colors, ensuring that there is an appropriately colored pair of breeches to match just about any noble look or theme. Pictured here, the Noblemen's Renaissance Breeches are shown with a simple renaissance-styled shirt, which is shown for effect but not included. 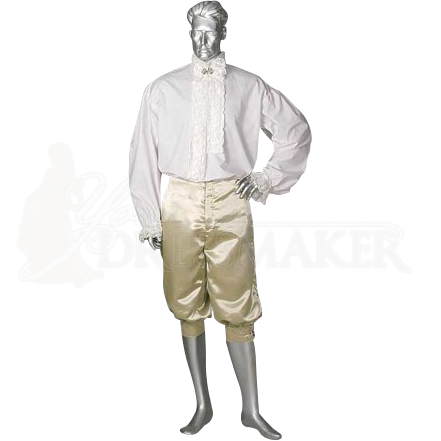 Once upon a time, it might have been hard to find a good pair of breeches to go with your stylish and regal looks and styles, but with the Noblemen's Renaissance Breeches, that time is passed.